I edited my question title to better reflect what I am asking. My Piston Harmony textbook (1st ed.) presents such a diagram. My Kostka Tonal Harmony (2nd ed.) does not and explains that in reality there is only one minor scale where the ^6 & ^7 are variable. So, I'm not looking for an origin to minor key harmony - I already know that from figured bass and the rule of the octave - and I'm not arguing the question of one versus three minor scales - better sources like Kostka explain clearly there is one minor scale. I want to know - to whatever extent is possible - the origin of the three minor scales concept. Surely this idea came earlier that Walter Piston. I think of this sort of like the origin of roman numeral analysis which I have seen attributed to Georg Volger and Gottfried Weber. which supplanted the earlier figured bass system for analysis and teaching. One system supplants another and obscures the methods and teaching of the past. I thought I should add notes about two historic examples that seem to be melodic minor, but are neither named that in the sources nor presented as one of three different minor scales. The earliest example I know of is Fenaroli's rule of the octave in Regole musicali per i principianti di cembalo. 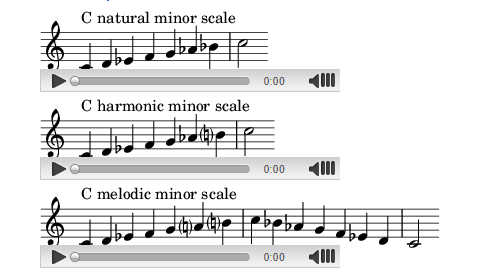 From the English translation I have seen, Fenaroli didn't apply a special name to this minor scale and he did not distinguish three different minor scales. It is simply the harmonization rule for the minor mode. Note that the middle bass clef is the actual bass, the lower bass clef gives the theoretical root of each chord. The next oldest example I know is Clementi's Art of Playing on the Piano Forte. As in the case with Fenaroli, Clementi presents only one minor scale and it isn't given a special name. The rest of the book goes on to present the scales for daily practice drills in all keys. After than over 100 pages of short performance pieces. Most of those pieces are in major keys. But of those that are in minor keys when the upper tetra chord of a minor scale is played descending in a figure subdividing the beat the raised ^6 & ^7 are frequently employed. It seems clear from these examples and those I gave earlier from Bach and Mozart that the treatment of the descending upper tetrachord of the minor scale depends greatly on whether the tones are functioning as essential harmony tones or figurative decoration. While this particular point is interesting it doesn't answer my question. I've looked at Bach, Mozart, Clementi, and Fenaroli (@KimFierens shared an example from Rameau which on the whole is the same as Fenaroli) but I don't yet have a historic source for the three types of minor scales concept older than Walter Piston. The standard textbook description of the melodic minor scale is the natural minor scale descending and natural minor with raised ^6 and ^7 tone when ascending. That textbook definition doesn't seem to hold water. ...where the circled descending passages maintain the raised ^6 and ^7 tones clearly because they are essential for the dominant harmony. It's interesting that immediately after m. 43 the original figure is stated again and the scale descent in m. 45 uses the lowered ^6, but this time, despite the harmony being dominant, the chord is specifically a vii°7 and so the lowered Bb is essential to form the diminished 7th chord. In both cases the inflection of the minor scales seems to be dictated by the harmony not the scale direction. Other examples can be cited in the two-part inventions. In fact all the minor key ones show descending 'melodic' minor, sometimes in the opening subject material, except when there simply isn't a descending scale passage using ^6 & ^7 (like the A minor invention.) Also, Mozart's Nannerl Notebook shows similar examples. Of course both of these are important historic pedagogical sources. Trying to explain away these as cherry-picked aberrations is a weak argument. Given the importance of harmony to dictate how the minor scale is inflected it seem especially unfortunate that textbooks use the labels harmonic and melodic minor in a way that doesn't jibe with how the music works. Equally annoying to me is the explanation that the raised ^6 in melodic minor is used to 'fill the gap'of the augmented second in the harmonic minor. Plenty of examples show that the augmented second was not objectionable in common practice style. So when and how did this three versions of the minor scale and raised for ascending, lowered for descending concept develop? It seems clear there is one minor scale and ^6 and ^7 vary depending on the harmony or a preference for a particular tonal color. If someone could provide actual pedagogical examples from around Bach's to Mozart's time of how the minor scale/harmony was taught, I would be especially appreciative. As for the minor mode, it differs from the major only in that the its third and sixth should be minor, although there are various problems with regard to the sixth, which we shall explain in the following book. The octave of the note Re [i.e., D] is usually taken as the model for all minor keys. [Table with the following notes: Re, Do#, Sib, La, Sol, Fa, Mi, Re, which Rameau calls Octave, Leading tone, Sixth note, Dominant-tonic, Fourth note, Mediant, Second note, Tonic.] The only difference between the ascending minor key and the major is that the third is minor on the one hand and major on the other. Descending, however, we must add a flat to the note Si [the submediant] and remove the sharp from the leading note Do. In summary, Rameau essentially distinguished between the minor mode (our harmonic minor) and the descending and ascending melodic scales, albeit in a not very clearly formulated way. The 1 is just. The 2 is major. The 3 is variable [according to the mode]. The 4 is perfect. The 5 is just. The 6 should correspond to the third. And the 7 is always major, being the support of the keynote. Observe that when the minor scale ascends, one makes the 6 major, and in descending one makes the 7 minor. This is all done to avoid the augmented second that occurs between the 6 and 7, the reason being that one recoils from the harshness of the sound caused by a [step larger than a whole tone]. If the partimento is in the minor mode, it can also descend by semitone [from 1] down to 5 inclusively. And this motion can accept various accompaniments. If the partimento will be in the minor mode, the ascent by semitone will start on 5, and it can proceed by semitone until 8, inclusive. As a personal opinion, I believe that Fenaroli's way of thinking about the minor mode and scales (i.e., not giving the scales any name, and chalking up any deviations as chromaticisms) is to be preferred to our current misleading and muddled terminology. From a jazz theory perspective, I have always thought of the derivation and naming convention for natural minor, harmonic and melodic minor as having to do with the insertion of the dominant chord in minor to create stronger resolution to the tonic harmonically - a "true V" chord if you will. The natural minor is simply the scale that comes "naturally" out of its relationship to relative major without alterations - there is no "true V" in harmony built on the 5th step (in above that would A- which has no pull or gravity to D-, it feels decidedly "modal"). The harmonic minor comes about from a "harmonic" consideration - that is an alteration of the natural minor scale to include the leading tone creating A7 dominant harmony. The melodic minor for "melodic" considerations - the ascension of the melody to the root. Although it would seem the feeling of minor is more enforced with Bb - a signal of minor key in addition to the minor 3rd that distinguishes it from major, it feels awkward to undo the B to Bb in the melody descent in above example given the zone of the melody. You can test it by singing thru it. You are more inclined to keep the B as it was ringing in your ear just previously. That is not the case with bar 45 where C#-Bb-A in bar 45. This is clearly a harmonic signal of implied A dominant to D minor. The Bb has melodic gravity down to the A dominant moving to D minor which is also reinforced by the bass moving to the D minor root. In bar 43 the harmony if over the 3rd of D, F.
The so-called descending form of melodic minor (essentially reversing harmonic minor to natural minor) is and as noted in the Bach example not consistently enforced, especially when it creates an awkwardness from the individual voices (as in bar 43 in above). I remember when taking Classical theory classes in college the professor scoffed somewhat at the so-called descending form of melodic minor with numerous contradictory examples in the musical literature. Generally speaking, there is a feeling of the quality of minor (as mentioned in the Rameau treatise above) that emphasizes the key characteristics that distinguish it from major - the 3rd and the 6th. The melodic minor in a sense breaks one pillar of minor feeling by having the B natural, making it essentially a major scale with a minor 3rd. But from a melodic perspective it makes more sense to literally ascend to the root as it does with typical passages in major. The Bb would indeed be awkward in this case because it has gravity to A not upward. Bach's music is inherently harmonically oriented but it is also contrapuntal individual voices so it is the just union of these to aspects that sometimes leads to some "rule breaking". Not the answer you're looking for? Browse other questions tagged scales or ask your own question. What are all the modes (scales) based on the major scale? Does this exercise combine minor scale forms in proper classical style? Is C-7 chord associated with one of the three minor scales?